It's really hard for everyone when parents separate - especially kids. Sometimes when parents cannot agree, the family courts will appoint a lawyer for the kids called the Independent Children's Lawyer. You will find information about this and other topics here. The featured video explains the role of the Independent Children's Lawyer. You can watch the interactive brochures for more information about Independent Children's Lawyers. The coloured speech bubbles and links at the bottom of the page have more information about family separation, legal stuff and helping you cope. Boys and girls from diverse backgrounds talk to the camera with questions about the ICL. Why do I have to have a lawyer? Where do I see the lawyer? And who will be with me? Does the lawyer decide what's going to happen to us? My mum says it's the judge who decides. Is that right? Will the children's lawyer do what I tell them? I know what I want although I don't want to hurt mum or dad's feelings. I just worry about saying the wrong thing. Yeh. Like whose side is the lawyer on? The ICL is talking with background of the courtroom and interviewing kids in the ICL interview space. Wow. That's a lot of questions! Ok. Lets see if I can help! I'm Jackie and I'm an Independent Children's Lawyer. Independent means that I don't take sides. I'm not mum's lawyer or dad's lawyer. 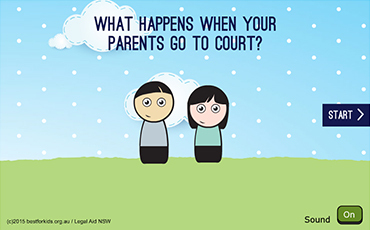 But if mum and dad go to court – sometimes the Court decides that the kids need a lawyer too. And my job is to help the Court decide what's best for the kids. So what I do is talk to the kids about their lives. And I also talk to teachers, doctors and psychologists and find out stuff that helps me understand more about you. The ICL is in a Court Room. She talks to the camera in an upbeat style of a kids' lifestyle or music show. As she talks the parents and their lawyers come into court. Ok, let's set the scene. Mum and Dad go to Court; arguing over parenting details. Where the handover should be, going to Nan's for your school holidays, that sort of stuff. And of course who you're going to live with and how much you will see your other parent. Going to court is hard and no-one likes it. But sometimes parents have to when they can't agree. The good thing is, kids don't have to. The ICL is now standing near the judge's seat. But the Judge is interested in you. They sit up at the front here. The judge 'magically' appears in the seat.the ICL is a little startled. Oh. Excuse me your Honour. The judge responds as though there is nothing unusual. Yes your honour. Thank you, your honour. ICL steps away a little further from the judge and continues. The judge is interested in what's best for you. And they listen to what everyone says about that. As the ICL points out the bar-table and area behind it, we see various characters appear as she refers to them. (mum, dad and their respective lawyers). The judge listens to mum and dad or their lawyers if they have one. And the judge also listens to me. Its my job is to make sure the Judge knows lots about your situation before making a decision. When a judge decides on what should happen – they make an Order. An Order is a serious legal decision and everyone - Mum and Dad and you – have to do what the judge says - about where you live, how much time you'll spend with mum and dad, and?handovers - all the stuff that your folks have been arguing about. Everyone except the ICL dissolve back out of the courtroom. She is alone again with her audience. The judge will decide – only if mum and dad can't agree. Sometimes mum and dad do agree before they go to court. Its part of my job is to help them reach an agreement - by making sure your parents focus on you and what you need. So I can talk to them or their lawyers and explain a plan I think is best for you –Sometimes they both agree. But if they don't then – yes the judge will decide. No. But we listen to your feelings and make sure that the Judge knows what you want. And try not to worry about what to say or what you think mum or dad might want you to tell me. Because I'm more interested in the day-to-day things; a day in a life of you! Like school and sport and friends and what you like doing with mum and what you like doing with dad. So I can begin to think what's best for you. But what you tell me is only part of the story. I talk to lots of people and read lots of stuff – to help the judge decide. Where will I see the lawyer and who will be with me? That's an easy one. Usually, we meet in my office. It takes about an hour. Mum or Dad wait outside while we're talking. Your views are only one thing that the Judge thinks about when they to decide. They also listen to your parent's opinions and what other people who know you have said. So please don't worry about saying the wrong things. Time for one more question. How will I know when the case is finished? The case finishes when mum and dad agree on a plan that's best for you - or the Judge makes a decision about what's best. When that happens I will arrange to see you and explain what's been agreed. It can be really confusing for kids when families break up.You might be feeling many different emotions and don't understand why. We've gathered lots of information to help you. Questions and Answers about Separation for Children answers lots of your questions. Reachout has on-line resources and contacts for teenagers. Headspace - This site has information to help you through tough times. Often parents can reach agreement after going to mediation but if they can't, the Court will appoint a kids' lawyer called the Independent Children's Lawyer (ICL). Our featured video explains the role of the ICL for you. ICL - for kids has information about the role of the ICL. Sometimes kids (and families) will be referred to see a Family Consultant. Why am I going to see a Family Consultant? has information for kids aged 5-8. Why am I going to see a Family Consultant? has information for kids aged 9-12. The Independent Children's Lawyer is appointed to make sure that the Court knows your views and they tell the Judge what they think is the best result for you. If you see a Family Consultant you can also talk to them about what you want. See fact sheet for younger kids and for older kids. What if you are unhappy about your Independent Children's Lawyer? If you have a problem, it is always best to talk about it with the person you are dealing with. The Legal Aid NSW website has more information about complaints. When families separate, arrangements for the kids are sometimes decided between the parents alone and sometimes with the help of a Judge or Federal Magistrate at the family law courts. 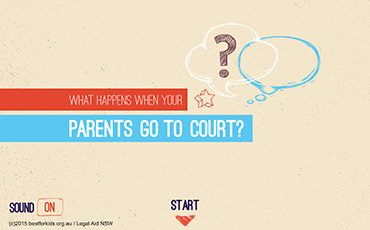 When parents can't agree, the main thing the Judge or Federal Magistrate will think about before making a decision is what's best for the kids. Lawstuff has lots of legal information for kids and young people. Family Law Courts for Children - You'll find helpful information from the Family Law Courts here. You'll find books, games and activities about separation here. reachout.com has on-line resources and contacts for teenagers. You'll find helpful information from the Family Law Courts here. You'll find helpful information for kids from the Family Law Courts here. Reachout is an online youth mental health service that provides info, tips and strategies for dealing with issues, as well as chat forums and links to other services. There is a page on dealing with custody arrangements, including how to cope and get the help you need. Headspace is a youth mental health site, for young people and their carers, which provides support, info, real-life stories and practical advice about getting your life back on track after a tough time. How to cope when your parents separate This site from South Australia Health provides some helpful info on how it might feel when your parents split up, what you can do about it and what might come next. Family Law Courts Find out about how the family courts work, the people involved and answers to other questions . This Federal Circuit Court site has info for 5-8 year olds and for 9-12 year olds, and for teenagers including a video about the special lawyers who represent young people in family matters. Independent Children's Lawyer - for kids has information about the Independent Children's Lawyer. Questions and Answers about Separation for Children has commonly asked questions about family separation. Why am I going to see the Family Consultant? This site has information for kids aged 5-8. Why am I going to see the Family Consultant? This site has information for kids aged 9-12. What happens when your parents go to court? These brochures provide information on the role of the lawyers who represent children when their parents are going to court (known as Independent Children's Lawyers). The info includes what sort of things these lawyers need to know, what they will tell the court about you and your situation, and how your relationship with them will work. There is a brochure for children and one for teenagers.